Dog poop isn’t a pleasant subject, but it is worth talking about. Why? Well, because it often paints a clear picture of your beloved pet’s health. Dog feces is actually a good barometer of how your pet is doing. Here’s a guide to what signifies healthy poop and other signs that could indicate something is wrong.  What is Healthy Dog Poop? As a dog owner, you might not take a second look at dog feces. You should, though, because it could help tell you if you need to have your pet checked out. Now, healthy dog poop tends to be somewhat moist and firm. You should use this as a baseline so that you can tell when something might not be normal. Another important consideration is the consistency of dog poop. There is actually a scoring system that’s assigned to dog feces. The system goes from 1 to 7. A “1” means the stool is very hard, and a “7” means it’s basically very runny, watery stool. A veterinarian can also tell a lot by looking at your dog’s poop. For example, they may notice worms in your dog’s feces. Now, worms in dog poop is a sign your dog has parasites like tapeworms or roundworms. It’s not uncommon to see worms in dog poop. 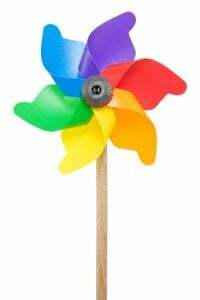 It’s also fairly common to see other things, including foreign materials like grass, plastic, or even rocks. Another red flag when it comes to dog poop is the presence of mucus. Be aware that even a little mucus can be a sign of an issue. Dog feces with mucus is easy to spot. It will look shinier and more slimy than normal. → Dietary changes – Sometimes, dog owners will change up their pet’s diet out of the blue, without making gradual changes. This can lead to an increase of mucus in dog poop. 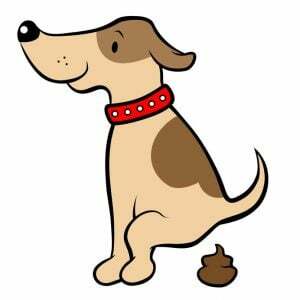 If you notice blotches or streaks of red in your dog’s poop, that could indicate bleeding in the gastrointestinal tract. It could be due to some sort of injury, or a disease such as colitis, which occurs when your dog’s colon becomes inflamed. 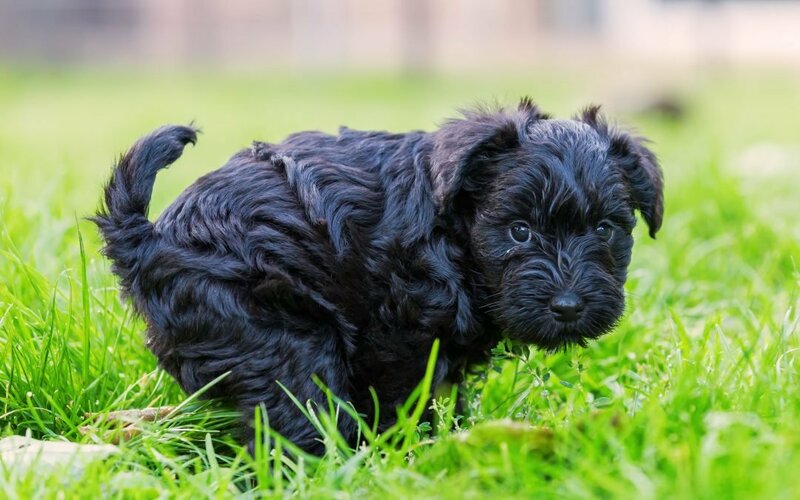 When dog poop comes out as a strange color, such as purple or pink, that could indicate dangerous bleeding due to a condition known as hemorrhagic gastroenteritis. What does green poop mean? This is usually the result of your pet eating a lot of grass. In some instances, however, it can be something more serious, such as a parasite.14Get to the vet to be on the safe side. If you have any reason to be concerned about the color of your dog’s poop, take them to the vet. It’s possible there’s nothing seriously wrong, but you want to make sure. 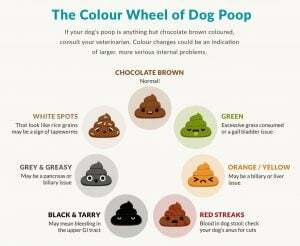 Your vet may show you a poop color chart to give you a picture of what’s going on. Just about every dog – and every human, for that matter – will have a bout with watery, runny stool now and then. If it only happens once in a while and your pet seems to be eating and acting normally, it shouldn’t be that big of a deal. At the other end of the spectrum is constipation. If it happens rarely, then you shouldn’t have too much to worry about. If it happens more often, something may be wrong. Now, there are a lot of potential causes of canine constipation. It could be an injury that’s affecting the pelvis, a reaction to a new medication or some sort of intestinal blockage.17Have a vet perform a thorough examination to determine what is going on. It’s important dog owners know any sign of blood in dog feces needs to be addressed as quickly as possible. If the stool looks black it could mean bleeding in the upper part of the digestive tract. If it’s red, the problem is probably lower in your dog’s system. Never ignore blood in the stool – always get it checked out. Don’t be nonchalant if you see something odd with your pet’s poop, be it color, consistency, or content. In many instances, the cause of strange poop isn’t too serious, but it pays to be cautious. In some cases, strange dog poop can be a sign that something is wrong. If you have any reason whatsoever to be concerned, set an appointment with your vet. 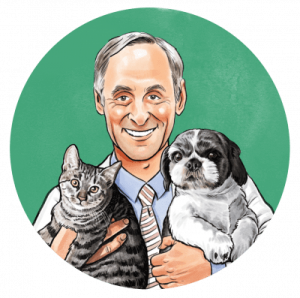 Don’t hesitate to seek medical help for your pet if you’re worried.